Nicolas Remisoff was born Nicolai Remisoff in St. Petersburg, Russia in 1884 and died in Palm Springs in 1975. He was a theatrical designer, painter, muralist, and architectural consultant. 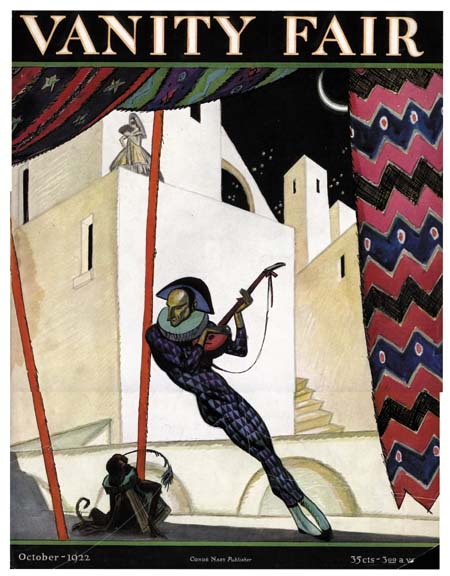 Remisoff's artistic style, which has been termed "Russian Vogue," had significant impact on the fashionable theaters and magazines of the 1920s. 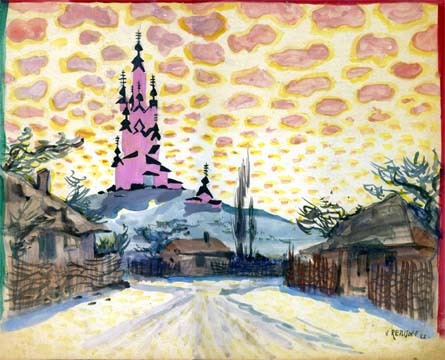 Along with Boris Aronson and Nicolai Roerich, Remisoff was one of the noteworthy 20th-century stage designers to emerge from Russia and to settle in the United States. Both his parents were actors in the Russian Imperial Theater in St. Petersburg. Remisoff, however, proved more enamored of drawing and design than acting. In 1901, Remisoff had finished his general education and married his wife Sophia. In 1902, they had their only child, a son Leonid. Remisoff worked odd jobs to support them for several years, but in 1905 Remisoff began to support his family as a caricaturist and political cartoonist. Remisoff entered the Imperial Academy of Fine Arts in 1910, after studing in a private studio for a year. After the revolution in 1917, Remisoff was to be put on trial as a dissident, so he fled with his family to Ukraine. The Remisoffs spent two years in Ukraine, before sailing out of Odessa for France. They arrived in Paris in 1921, and quickly assimilated into the society of other Russian emigres who had settled there. Nicolas painted and exhibited with the Paris World of Art, and after this exposure was invited by Nikita Balieff to serve as principal artistic designer (along with Sergei Sudeikin) for his theatrical company, Chauve-Souris, the Bat. The Chauve-Souris, a unique manifestation of Russian cabaret theater, originated in the Moscow Art Theater and gained fame as it moved with Balieff to France. The cabaret played for two years in Paris to a devoted audience, and then traveled to San Sebastian, Spain, before finally moving on to London and Manchester -- achieving an unqualified success in all venues. After these European successes, the Chauve-Souris traveled overseas and took New York by storm in 1922. 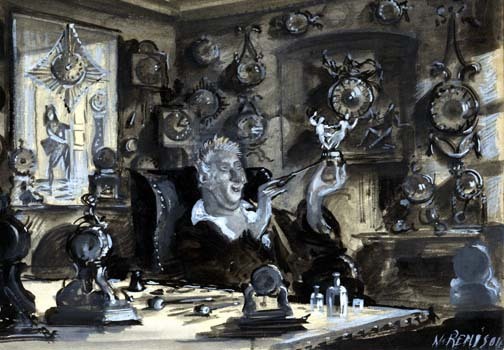 A set design for the Chauve-Souris. The popularity of the Chauve-Souris led to a mania in New York for themes Russian. Remisoff himself became a fashionable figure, and soon was quite busy with commissions in addition to his work for the Chauve-Souris. He frequently designed covers and illustrated articles for Conde Nast publications, including Vanity Fair, House & Garden, and Vogue. Remisoff also illustrated advertisements for a variety of publications, designed the cover of one of Anna Pavlova's dance programs, and exhibited and sold his drawings at the Wildenstein Gallery where he had a one-man show in 1922. It was in New York that the artist met beauty maven Elizabeth Arden, who selected Remisoff to design her newest beauty salon. This commission launched a partnership that would continue until Arden's death in 1966; over the ensuing years Remisoff would design fashionable Arden salons in New York, Chicago, San Francisco, and Hollywood. Left: cover for a 1922 issue of Vanity Fair. Remisoff's signature was inadvertently left off the cover; a written apology was printed in the next issue to assuage the ruffled feelings of the artist. 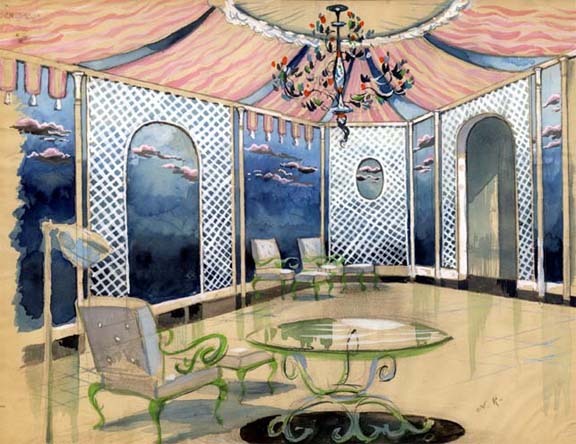 Right: a design for the interior of an Elizabeth Arden salon. Often fabric swatches would accompany these designs to assure a good color match. In 1924 Remisoff quit the Chauve-Souris, breaking with Balieff to open a Russian-themed nightclub called Club Petrushka with co-owner Theodore Bauer. Remisoff completely designed Club Petrushka, not only painting the many murals that decorated the several floors of the establishment, but also arranging and training the "Gypsy" entertainment that was to be a feature of the club. After the destruction of Club Petrushka in a fire in 1925, Remisoff moved to Chicago, remaining there until 1935. When Remisoff arrived in Chicago, he rapidly became as busy as he had been in New York. From 1925-1926 he taught stage design at the Chicago Art Institute, though he soon abandoned that post for more creative duties. Most of Remisoff's Chicago years were devoted to designing sets and costumes for the Adolph Bolm and Ruth Page Ballet companies. During the years of his Chicago residence, Remisoff designed more than 20 ballets. Remisoff also created sets for the Chicago Grand Opera. His designs for Strauss' Salome were among his most popular. A reproduction of a photo of the murals that decorated the interior of Club Petrushka, which burned down in a tragic fire in 1925. 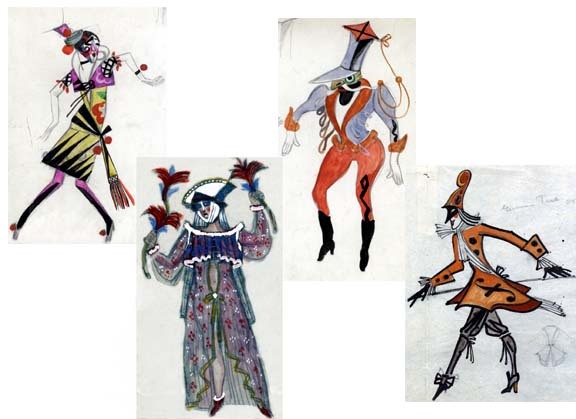 Below left: four details of costume designs, including that of the Violin (lower right corner) in the 1927 Adolph Bolm ballet Tragedy of the Cello, which premiered on March 3rd at the Eighth Street Theater, Chicago. 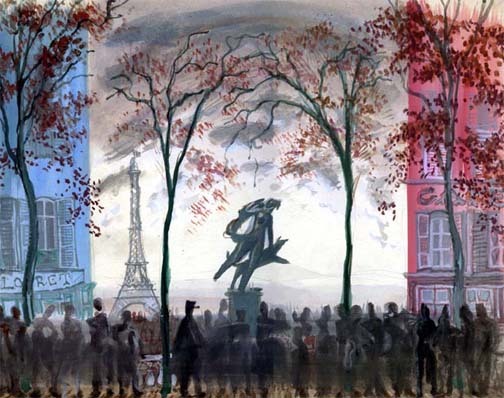 Below right: the backdrop for the 1936 production of An American in Paris, choreographed by Ruth Page. In addition to the artistic works and projects mentioned above, Remisoff consulted on architectural projects. These included commissions for the General Motors Cadillac Salons; the Sears Roebuck building (a part of the Chicago World's Fair); and designs for the Punch and Judy Theater and the New Palace Theater. Remisoff also worked as a graphic artist, illustrating covers for the Marshall Field & Co. catalogs and creating advertisements for other companies, including luxury car manufacturers Cadillac and Murray Corporation in Detroit. Remisoff also continued to work as a fine artist, producing paintings on Russian themes for sale and exhibition. He had exhibitions at the Arts Club of Chicago (1925), the Laura Davidson Sears Academy of Fine Arts (ca. 1926), the Art Institute of Chicago (ca. 1926), and the Century of Progress Exhibition (1933). In 1935, Remisoff went to San Francisco to join Adolph Bolm, who had become Ballet Master of the San Francisco Opera, to design sets and costumes for a production of Rimsky-Korsakov's Le Coq d'Or. Remisoff exhibited these designs and gave a series of lectures at the San Francisco Museum of Art during the run of the opera, from the late fall of 1935 through early 1936. During their stay, the Remisoffs discovered that they found the climate of California congenial, and in 1938 the Remisoffs moved to California for good. An unidentified set design from the 1930s, possibly for a Michael Chekhov production. 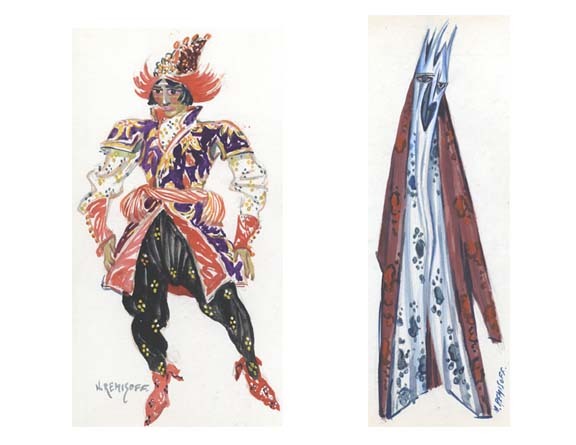 Left and below: two costume designs from the 1940 Hollywood Bowl production of Firebird, conducted by Igor Stravinsky and danced by the Adolph Bolm Ballet. The two figures are (left) the Tsarevitch Ivan and (right) Kotschei the Immortal. Remisoff worked for a time in San Francisco with Bolm before moving to Los Angeles. From 1939 until his death, Remisoff made his home in Southern California, dividing his time between a summer house in Palos Verdes and a winter residence in Palm Springs. While in Los Angeles he continued his professional association with German director Max Reinhardt and forged a new one with director Michael Chekhov (nephew of Anton Chekhov). Remisoff created scenic designs and costumes for a number of Michael Chekhov's plays, including his production of Gogol's Inspector General. 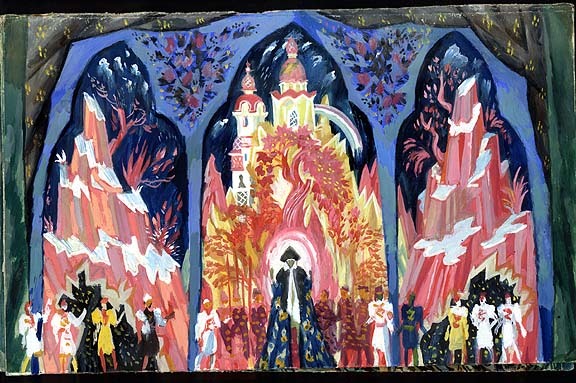 Remisoff also continued his work for the ballet, designing sets and costumes for Stravinsky's Firebird for a Hollywood Bowl production choreographed by Bolm and conducted by Stravinsky himself. By 1939 Remisoff began to move away from live stage productions. He renewed his interest in portrait and landscape painting, touring Mexico for several months to make special studies of its people and scenery. These studies ultimately resulted in a series of lithographs that were exhibited in Chicago and New York, and became the germ of Remisoff's new passion: art on Southwestern themes. But this new interest would have to be indulged in his spare time, for upon his return to Hollywood Remisoff found his schedule increasingly occupied by set design for television and motion pictures. In the summer of 1939 Remisoff began work on his first motion picture as art director for Lewis Milestone's production, Of Mice and Men. The success of Of Mice and Men helped to establish Remisoff in the movie industry, which would become his principal employer for the next twenty years. Remisoff was particularly known for his attention to accuracy of detail. Before his career was finished, Remisoff acted as art director or production designer for 31 movies, including The Red Pony, and four television series. Remisoff retired from the film industry in 1960 with the completion of Ocean's Eleven. 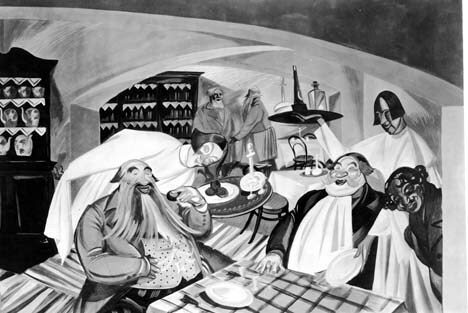 A scene design for the 1949 production, The Red Pony. 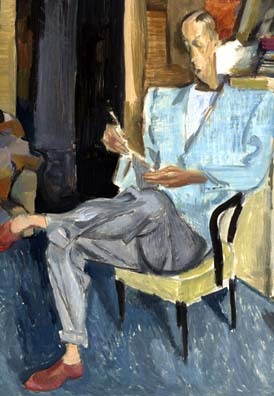 Left: an unidentified portrait of a man reading a letter. 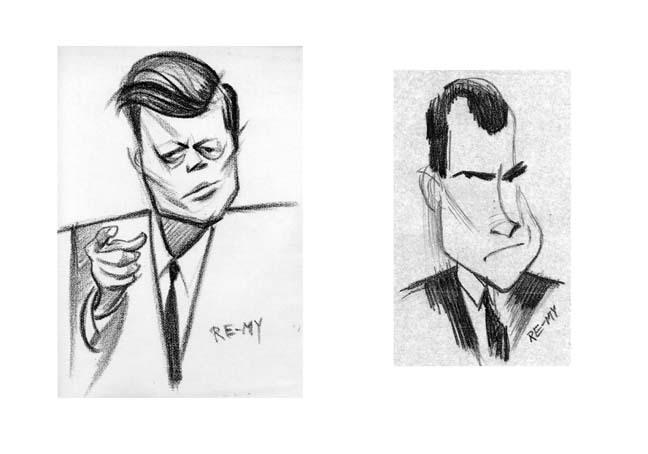 Center: Remisoff revived his "Re-Mi" persona for these caricatures, drawn during the 1960 Presidential debates between John F. Kennedy and Richard Nixon. It is not known for whom Remisoff voted. Bottom: an oil-on-wood study of a California mountain landscape. Remisoff spent the remaining years of his life in personal artistic pursuits. He completed countless sketches, landscapes, portraits, and charcoal drawings, including a revival of his Re-mi persona in the form of his illustrations of the 1960 presidential debates. Remisoff also continued to delight in the California landscape, painting many studies of the mountains, deserts, and beaches near his home. The Remisoffs retired to their Palm Springs home in 1965. Sophia passed away later that year, leaving Leonid and his family as Nicolas's only surviving kin. Nicolas Remisoff lived for ten more years in Palm Springs until his death in 1975 at the age of 91 in the California Convalescent Hospital, Palm Springs. The Nicolas Remisoff papers includes more than 400 original works, consisting of full-size watercolor drawings, some black and white drawings, and numerous oil paintings. The earliest dated drawing is from 1921. The archive covers all aspects of Remisoff's career and shows in detail his strengths as a set designer, costumer, muralist, portrait painter, professional designer, caricaturist, and illustrator. There are also several files of correspondence and photographs related to Remisoff's professional commissions for salons and movies. In addition, there are three personal scrapbooks that contain numerous original photographs (many of them studio shots), newspaper clippings, and printed ephemera. Looked at in its entirety, the archive provides both a detailed record of Remisoff's career and an important, if incomplete, personal record of his life. Armond Fields (1930-2008) was an author, artist, art collector and business consultant. Born in Chicago, Illinois, to Louis Max and Esther Fields, he attended schools in the Mid-West. He received his B.S. from the University of Wisconsin (1953), M.A. from the University of Illinois (1955) and Ph.D. from the University of Chicago (1956). He wrote several biographies, primarily on vaudeville performers. His oil paintings, drawings and prints have been exhibited in the United States and Europe. He curated, wrote catalogues, and donated the art for various exhibitions (most recently: Paris, Turn-of-the-Century, Santa Barbara Museum of Art, 2003; Vaudeville is Dead! Long Live Vaudeville!, Doheny Library, University of Southern California, 2005). Fields also served as a consultant in the areas of market strategy and consumer behavior including as a self-employed marketing consultant (1969), for Interpublic Co. (marketing and research vice president, 1960-69), for Audio-Video Entertainment, Inc. (corporate officer, 2000-?) and for AltaVoice Communications (consumer behavior consultant, 2001?). Fields was a social historian specializing in American popular theater from the late nineteenth to mid-twentieth centuries. Fields began researching his own family's involvement with early musical theater in New York that led to a biography of his great-uncle Lew Fields From the Bowery to Broadway: Lew Fields and the Roots of American Popular Theatre (1993). He also wrote Eddie Foy: A Biography of the Early Popular Stage Comedian (1999), Lillian Russell: A Biography of "America's Beauty" (1999), James J. Corbett: A Biography of the Heavyweight Boxing Champion and Popular Theater Headliner (2001), Fred Stone: Circus Performer and Musical Comedy Star (2002), Sophie Tucker: First Lady of Show Business (2003), Maude Adams: Idol of American Theater, 1872-1953 (2004), Women Vaudeville Stars: Eighty Biographical Profiles (2006) and Tony Pastor, Father of Vaudeville (2007). He also authored a social reformist biography on Katharine Dexter McCormick: Pioneer for Women's Rights (2003). His interest in French culture resulted in publishing Henri Riviere (1983), George Auriol (1985) and Le Chat Noir: A Montmartre Cabaret and its Artists in Turn-of-the Century Paris (1993). The Armond Fields collection consists chiefly of materials which Armond Fields used or created during the course of his research into American vaudeville and early theatre. There are copies of photographs and a few originals of some of the stars about whom he wrote, as well as other material related to the Vaudeville era: sheet music, theatre programs, newspapers, etc. Also included in the collection are all Fields' research notes for his many books as well as the drafts of the manuscripts. In addition, the collection includes audiotapes of Fields' interviews with family members of some his subjects, and videotapes of early film footage.